An adorable kitten who no one wanted because of her supposed "uncanny resemblance" to Adolf Hitler has now found a forever home. "Kitler" as she was dubbed by the media (her real name is Luminus), was found near death on a busy street on July 22nd, and brought to Wood Green Animal Shelter, where staffers initially thought she was only four-weeks-old because of her small size. 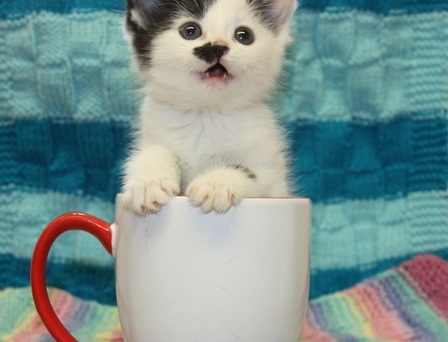 "Kitler is an adorable little girl who will make a wonderful addition to the right family. She is really playful and a typical sweet kitten. We rehome five and a half thousand animals every year but we cannot find a loving owner for Kitler. We think her unusual markings are putting people off." Has no one ever seen catsthatlooklikehitler.com? "We are delighted to say that we have now found a wonderful, loving home for Luminus and we hope this will be the start of a long and happy life for her, now that she has a second chance." Aw, so sweet. Glad the name was only made up. i love catsthatlooklikehitler.com !! this kitten is sooooo cute! glad it's a happy ending! I'm so glad to hear that the kitty was adopted. And glad she has a better name. She is adorable. And we hope those people that called about her decide to adopt a cat in her honor! Judged by her markings? Like people would actually not want her specifically because that. Ridiculous. But I suppose if it wasn't for all the media she might not be as lucky. Glad she has a home now!